Cat and Nvidia are the start of earning reports that are still blaming a slow down in China as a result of weaker earnings and forecasts.1 Nothing new here. The market conditions are still volatile as warned and expected. Till we speak again, stay warm, especially if you are in Chicago since they are supposed to have arctic type cold temps this week! For the first time in months, U.S. markets experienced little movement last week. The Dow and NASDAQ did have their 5th week of gains in a row, but their increases were small: 0.12% and 0.11%, respectively. 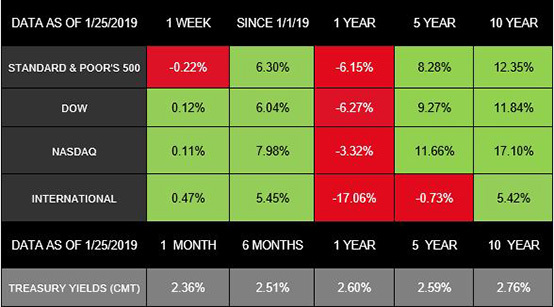 Meanwhile, the S&P 500 broke its 4-week winning streak with a 0.22% loss.Internationally, the MSCI EAFE also posted modest returns, gaining 0.47% for the week.